Anchors securely to existing wooden decks or concrete patios - looks great on a mobile home or RV. Roof is detachable for easy maintenance and winter storage. Rust-proof fiberglass screens allow cool air to circulate while keeping out mosquitoes, flies and other insects. Three-ply vinyl roof that resists mildew. Heavy-duty galvanized metal frame with baked-on architectural finish to resist fading and oxidation. Patio Mate Screen Enclosures are the perfect addition to your house, yourmobile home or even an RV to add summer living space! Patio-Mate screenedenclosures fit existing wooden decks or concrete patios and can be anchoredsecurely to the concrete or wood. The roof is detachable for easy maintenanceand winter storage. Rust proof fiberglass screens allow cool air to circulatewhile keeping out mosquitoes, flies and other insects. 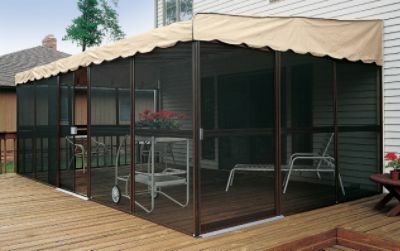 Patio Mate Screen Enclosures are constructed from the finest materials foryears of outdoor enjoyment. Feature sturdy aluminum frames with a baked-onenamel finish, and rust-proof fiberglass screens to provide refreshing cool aircirculation without insects. 3-ply vinyl roofs resist mildew. All models have sliding doors! 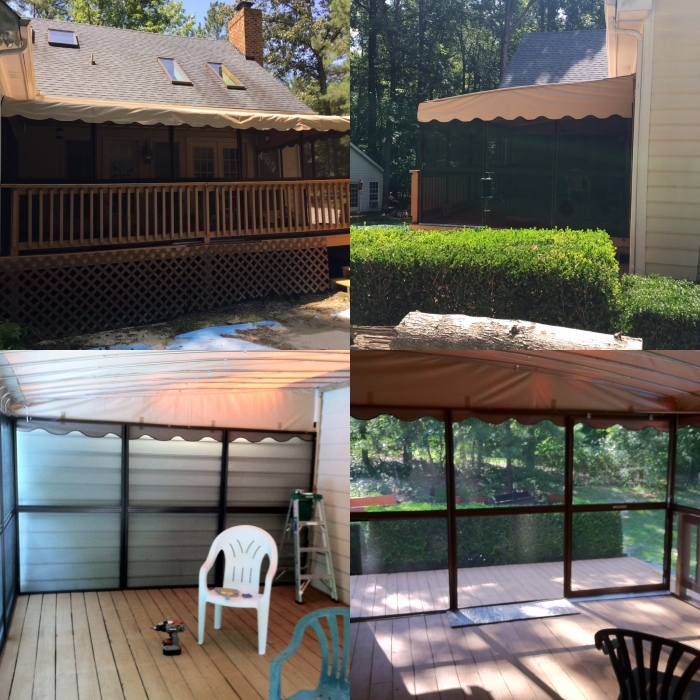 These durable screened enclosures can beinstalled in an afternoon and will provide summer after summer of relaxation andenjoyment. Will winter weather harm the walls that remain in place - cover is removed - correct? Does snow drift tend to build up in the enclosure - harm the screen? Performance in high winds? Do I need workspace on outside of enclosure to assemble? Can I choose the location of the two doors? The manufacturer, Kay Home, advises that these can hold winds up to 25 miles an hour, but it doe not have a snow load rating. The workspace would be dependent on the customer, and how you plan to install it. You are able to choose the location of the doors. How durable are the screens? I have cats. The screens are very durable. Of course, we haven't tested them with cats so we could not guarantee they would withstand that but the screens are very well made. Thank you for your interest! How would you attach this to the exterior walls of a travel trailer? The mounting hardware attaches to wood furring strips, which you would need to supply. Foam strips are included to place between the furring and your wall surface to prevent moisture and bugs from getting between them. Can the sliding doors be put at different sides? The sliding doors are not recommended to be installed in on different sides. How does this stay connected to the wall of the house? The structure will attach to the house using a series of U Channels and C channels, which you will secure to your house with screws through a furring strip. You can find complete details in this instruction manual: https://lib.store.yahoo.net/lib/yhst-84104761184795/patiomatemanual.pdf#_ga=2.73227989.717991450.1549894813-2103746238.1534857171. Does the enclosure have a lock? This enclosure does not come with a lock installed. Do I need to remove the canvas in winter? This enclosure is indeed designed to be left up year round. The manufacturer recommends removing the top if severe storms or snow are expected. What do I use to treat the cover? That cover is a mildew resistant vinyl and is not necessarily in need of any treatment. Where can I find another copy of the instructions? The instruction manual is available for download here. Do you need a permit for this item? That will depend on your local laws. It is often a good idea to also check with your homebuilder's association. The manufacturer, Kay Home, advises that these can hold winds up to 25 miles an hour. If the screen in a panel is damaged, can the panel be easily removed for repair? The screens can indeed be removed from the framing and replaced. Do the walls remain up during winter? This enclosure is indeed designed to be left up year round. I have a concrete patio that slopes from the house for drainage. Does the surface for this screened enclosure have to be level? Per the manufacturer, it must be set up on a level surface. How many doors does a 7 x 19 patio mate have? Also, how much does it weigh? The Patio-Mate Screened Enclosure 7x19 has 2 doors. It measures out to 92 x 138 x 88 inches and weighs 151 pounds. Will we be able to put this on a Trek deck? As long as you do not mind drilling into it for anchoring purposes, there are no prohibitions against using it on a Trek deck. Are the sizes given a true size? Yes, the sizes given are true sizes. What is the height of the 45" wide panels? Per the manufacturer, the individual panels are 75 inches in overall height. Approximately how much time would it take to remove the sides in the fall and replace them in the spring? Disassembly will depend upon one's skill level. Please refer to this manual which discusses the assembly of the complete unit. You will see the steps involved and judge the time based on your own ability. What should we do if it's windy? Should we roll this up? If severe winds or storms are forecast, removal of the roof from your Patio-Mate� is recommended. The walls do not roll up and are fixed in place. Do I need anything else to put together this kit? Can I get this for an RV? These are designed to attach to your house only. Does the screen room have to be attached to the house? Yes. For proper support and performance, the screen room will need to be attached to the house. How is this attached to the house? The structure will attach to the house using a series of U Channels and C channels, which you will secure to your house with screws through a furring strip. You can find complete details in this instruction manual. What is the shipping size and weight for 8' 6" x 17" Patio-Mate screen enclosure? The shipping weight is 178 pounds and the shipping size is 2.125 inches deep x 36 inches wide x 49.25 inches high. Is this unit waterproof and does it need to be taken down every evening? The top is waterproof, though rain can get through the screens. Rain gutters are required on the house above the Patio-Mate to prevent damage from excessive water accumulation. You do not have to take it down every evening but it is not designed to support a snow load. You will need to remove the roof in the off-season. If severe winds or storms are forecast, removal of the roof from your Patio-Mate is also recommended. How long has this product been on the market? What is the projected life cycle e.g. 1, 2, 3 years? The product has been on the market since the early 1980's. The projected life span will depend greatly on your care of it and your location. If you follow all care and maintenance instructions you can expect it to last up to 10 years and sometimes longer. Can you put the door anywhere on the sides? Yes, you can put the doors on the side you choose. I am thoroughly enjoying the fruits of my labor with this kit. It was a frustrating assembly process (see below), but well worth it! ProsSignificantly more cost effective than building from scratch or hiring a GC to complete! Good quality for price. The size varieties offered were the most important factor; offering a size that exactly matched the upper deck. Two entry doors are a big plus. ConsHardware was packaged in one large plastic bag which contained numerous smaller bags, each labeled with a letter from the alphabet. Each bag contained an assortment of hardware. The instructions made absolutely NO reference to the "lettered" bags! Nor did the packaging or grouping have ANYTHING to do with assembly! In order to inventory the hardware, it was necessary to open EVERY SINGLE BAG and reorganize the hardware by type to match the inventory listing. The instructions did NOT reference the hardware by the name(s) given in the inventory list; rather, they were each identified by measurement(s)!!! Absolutely no consistency! This resulted in an inordinately slow assembly process. I have a deck that I could not enclose due to permit regulations in my town. This enclosure is absolutely THE best! I love the size of the sliding door and the overall structure is very sturdy. since I live in New England, we do take down the awning every year to protect it from the snow. My handyman does this in less than a half hour. I am able to go outside at night and not get eaten by bugs. One of my best purchased ever!! everyone loved this room. we have alot of mosquitoes, and this room really helped. we had a freak hail storm and now i have to order another roof, but our cars were damaged also, so it holds up pretty well. We purchased this item at the beginning of the summer season. We needed shelter from the south sun and pesky bugs...this was PERFECT. Great quality and design. Our friends loved it so much that they purchased one too! This is a great buy. Takes about a day to assemble. Instructions are easy to understand also.